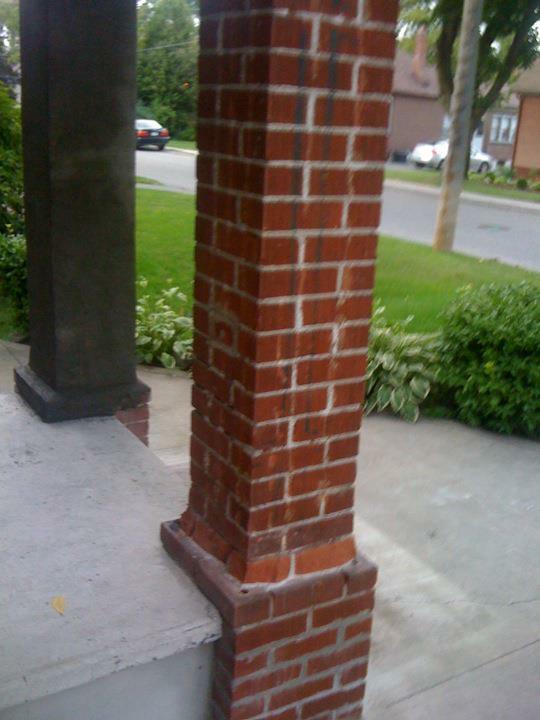 I was hired recently to replace a damaged front porch post. This is another one of those instances where you really don’t know how much damage is actually evident until I had completely dismantled it. 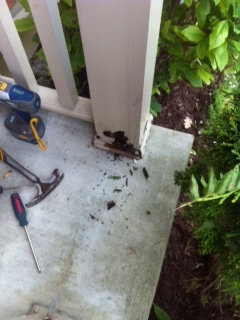 As you will see, there was quite a bit of damage to the original post due to moisture and carpenter ants. Once the new post was in, I then gave the railings a nice coat of paint to give the a nice clean finished look. This is the original damaged post I removed. I know it’s a little difficult to see in this photo but have a closer look at the damage on the top end of the post. Basically it crumbled instantly. Good thing my client decided to get the work done. If left unchecked, this post would have surely failed in supporting the roof. 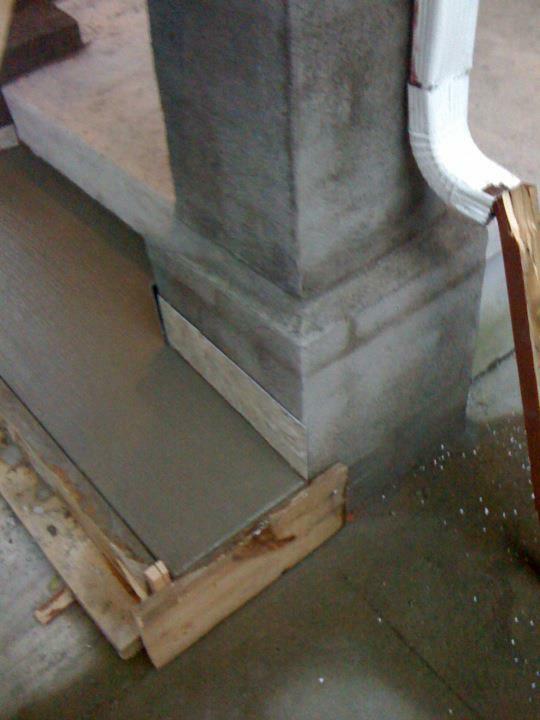 The damage as shown in this photo, has been caused by the post being installed directly on a concrete surface resulting in moisture being transferred from the concrete into the wooden post. 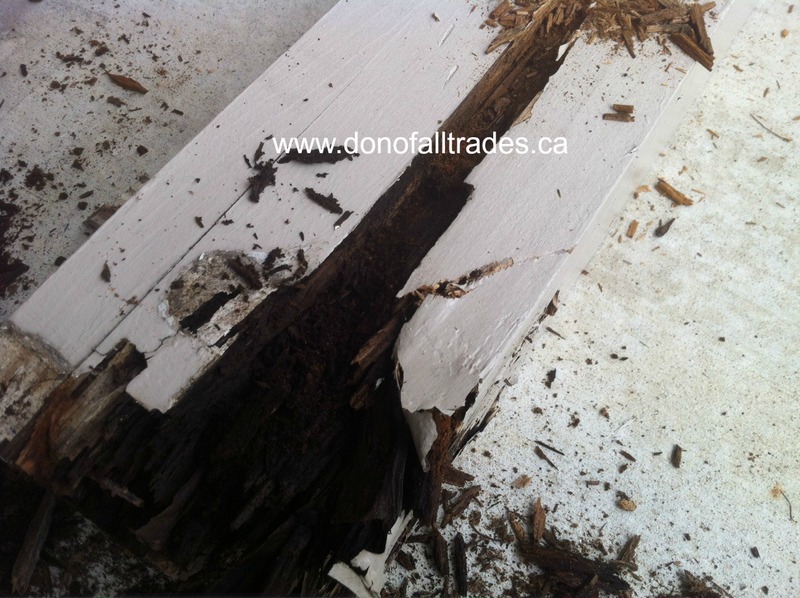 There was no moisture barrier put in place to prevent this damage from occurring. 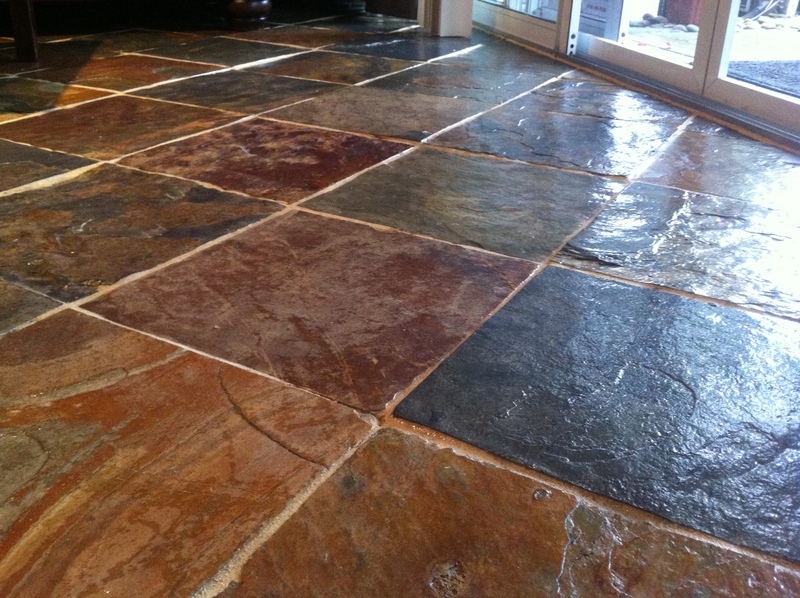 When ever building, wood should never come into contact with concrete without a moisture barrier put into place. Not only was the post damaged my moisture, also a colony of carpenter ants decided to make a comfy home inside this post. 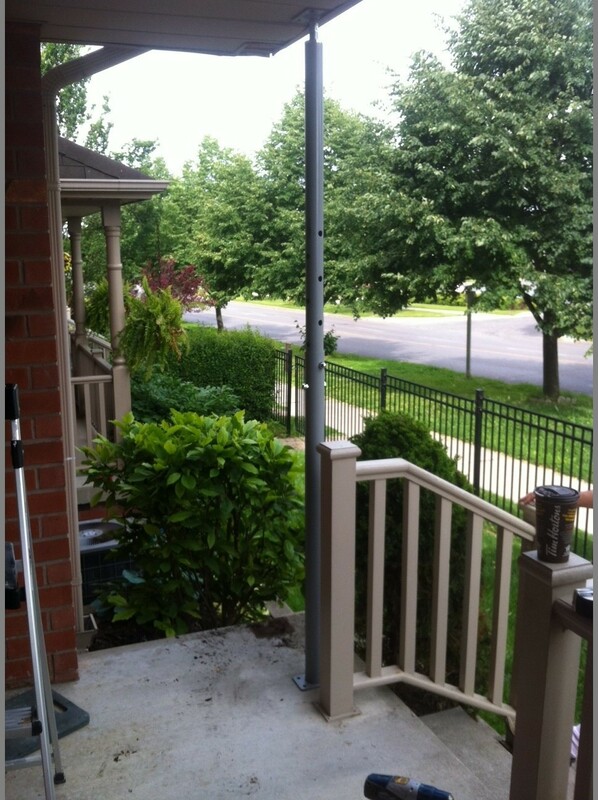 I put in place a jack post to temporarily support the structure while I installed a new post. 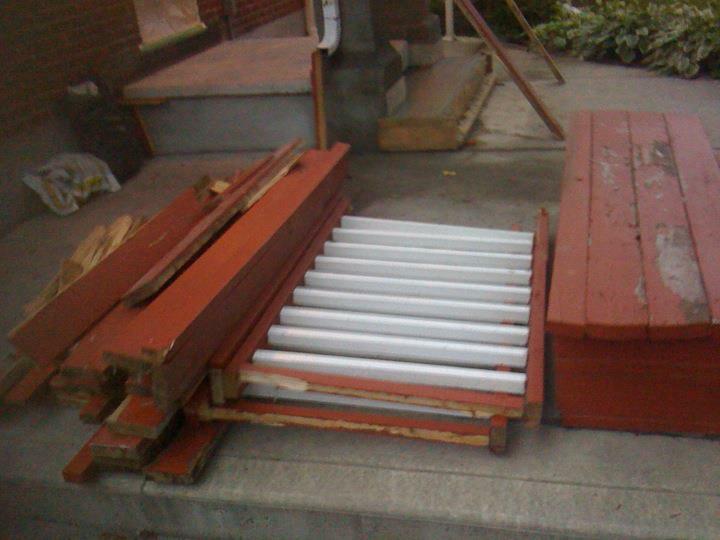 The end result as you can see in this photo, is that I used an 8 ft. primed colonial porch post having a load bearing limit of 5,800 (lbs.) . The post also has a moisture barrier seal on the bottom. I also installed a quick mount elevated bracket. this bracket provides a ventilating moisture barrier between post and ground. By doing these two steps we will prevent water damage, increasing life of post by years. Now don’t get me wrong, anything that you build doesn’t last forever. This just extents the life of the product. On July 1st, Canadians celebrate Canada Day. It’s a national holiday to commemorate Canada’s Birthday and is a statutory holiday. 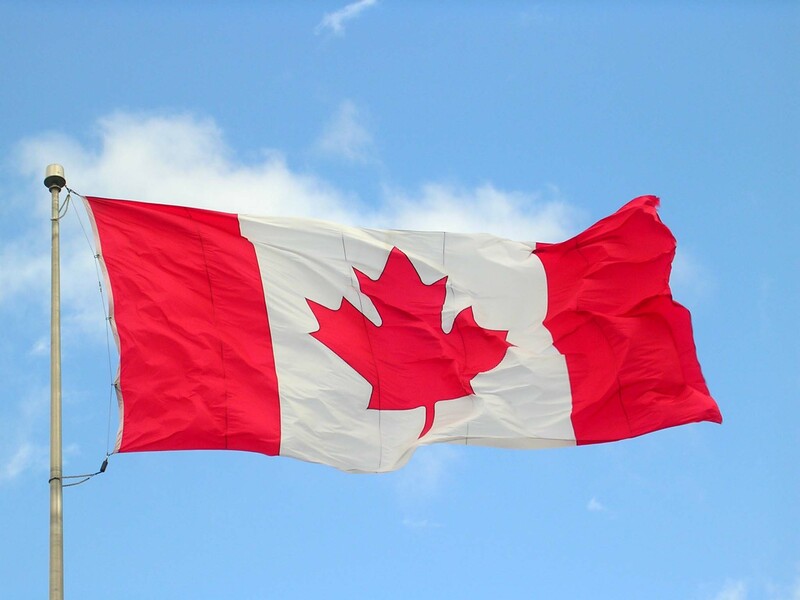 Canada Day represents the British North America Act, which united three colonies into a single country called Canada that was originally called Dominion Day. This holiday was renamed in 1982. To some, Canada is well-known for its Inventors, Oil, Hockey, Healthcare and Bitterly Cold Winters. As a Canadian myself, I am happy for our Tim Horton’s, Beaver Tails, Toque and even our accents eh? Canada is a beautiful country and I am Proud to be Canadian! Happy Birthday Canada! We Love You Canada along with your Beauty and Glory! Want to leave a Birthday Greeting to our Beloved Canada? Please leave it in comments section below! Watch Our Happy Birthday Video! Don of All Trades installs Low-Flow Irrigation systems for your home or business. As more communities face water shortages, many people are noticing how simple and practical these low-flow irrigation systems can be. Once these systems are installed they not only conserve water, they save a lot of work. Tired of spending your time winding and unwinding hoses, attaching and moving sprinklers, and so on? Also known as micro-irrigation and low-flow watering systems these use much less later than conventional methods. They distribute water close to individual plants, so water goes only where it’s needed. There’s so many attachments to choose from to make this system work for you. Imagine enjoying your BBQ steak dinner outdoors while you’re watering your gardens at the same time! And YES we install them! 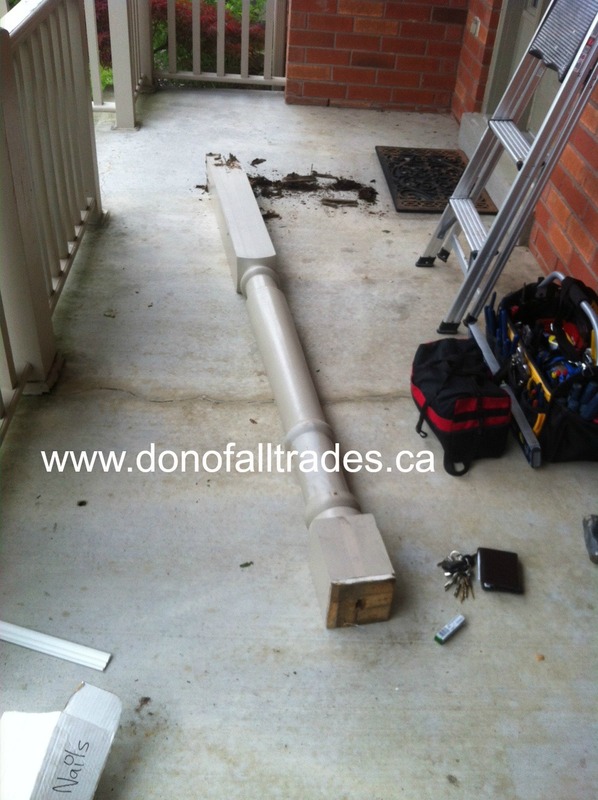 Please visit http://www.donofalltrades.ca for more information on our services or call to book your complimentary assessment at 905-259-5249. 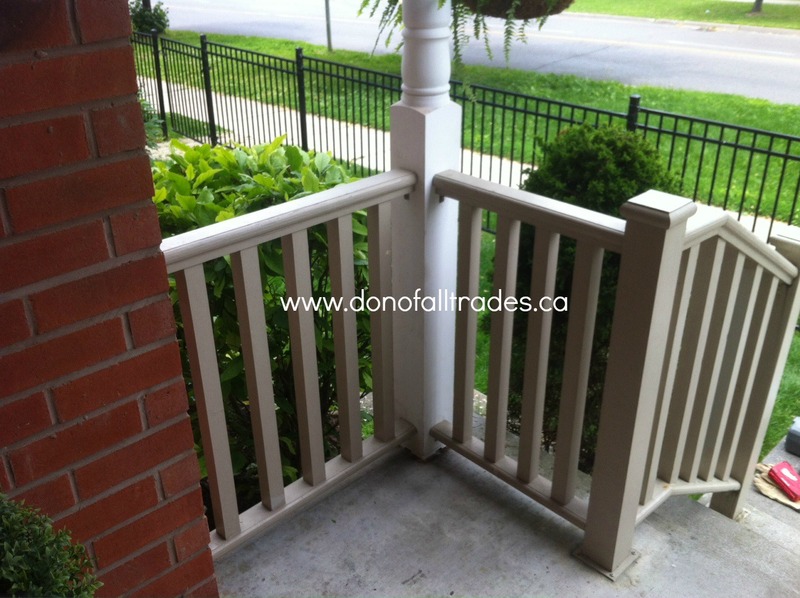 We are very pleased at the end result of giving this old porch an new look. 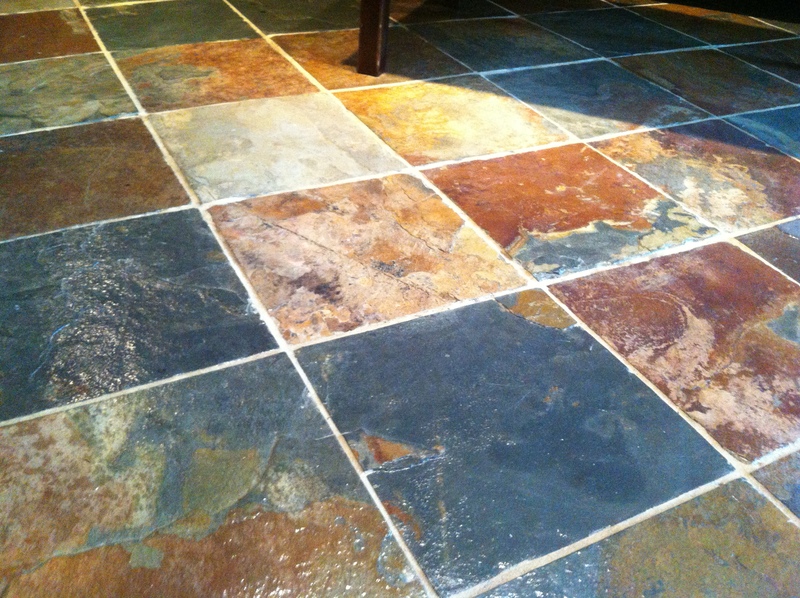 With a little hard work, patience, concrete and skill anyone can have this cleaned and finished look! 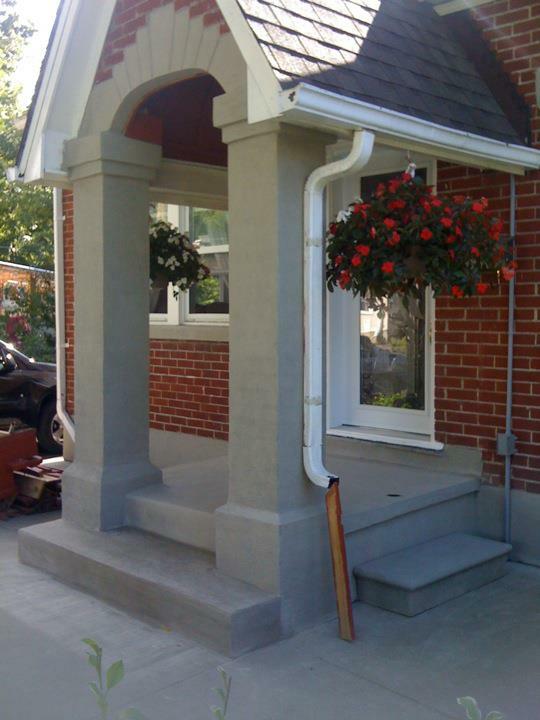 This home owner had upgraded this front porch years before over the existing concrete porch with cedar wood. Every year the spindles, handrails, base, pillars and steps had to be re-stained as part of their maintenance. Well we decided to get rid of it and to our surprise we had an opportunity to work with the original steps and base since they were in good enough condition. 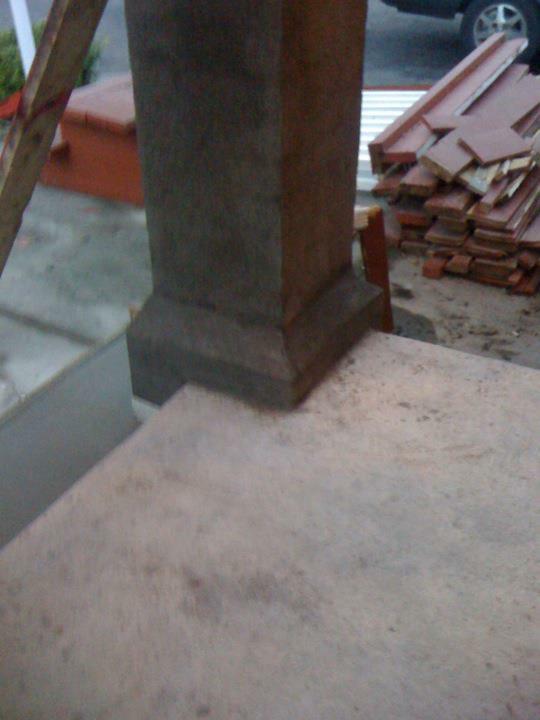 Condition of the porch base, steps and pillars after all the cedar was removed. 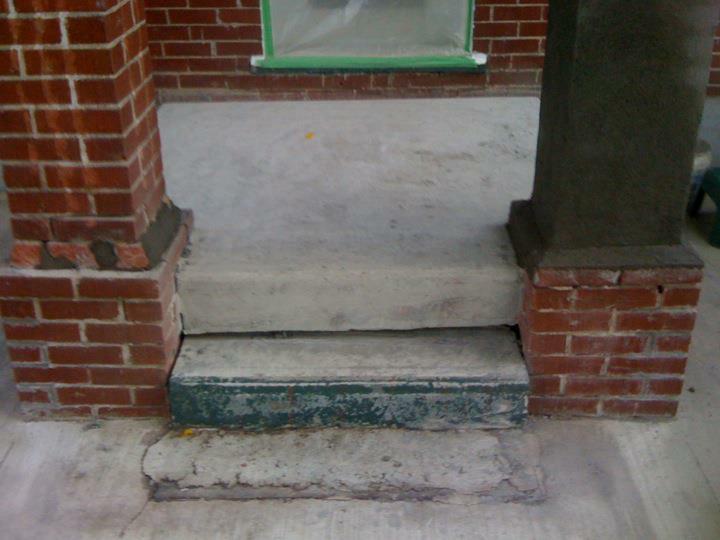 A new wider step was formed from concrete to give a more even look to the form of the steps and the porch. 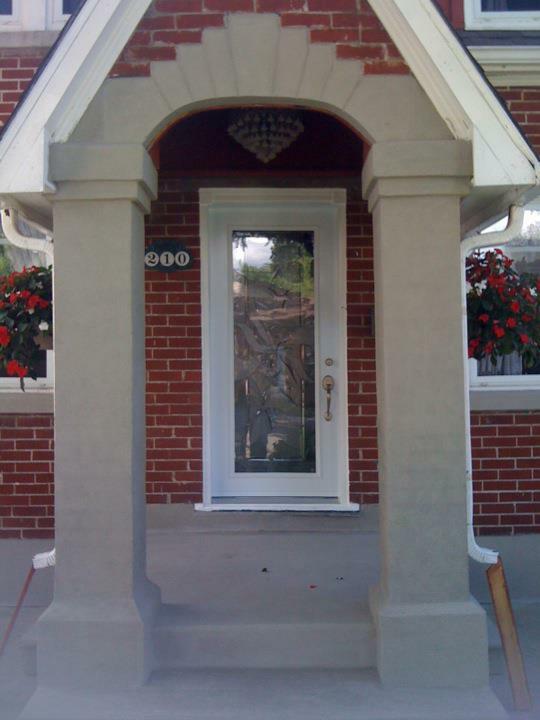 These pillars were in very good condition considering the age of this 75 year old home. 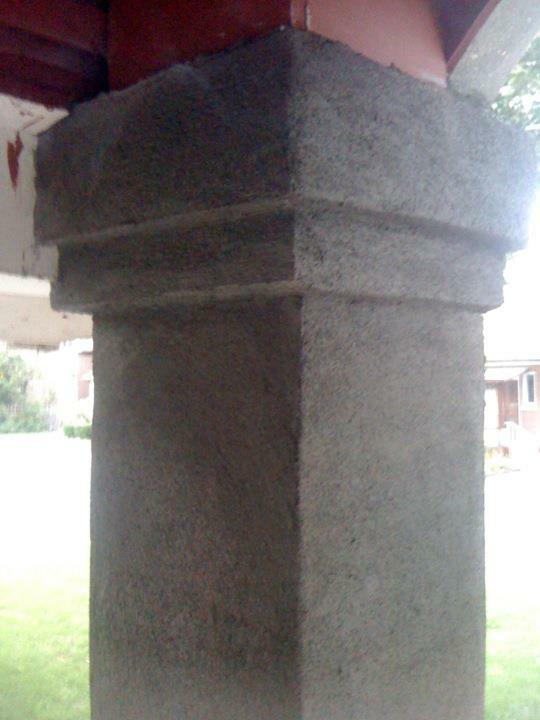 Concrete was incorporated to the pillars which defined the accents on them. This gives off a new, fresh clean look and more character to the entire porch. Finished Product. 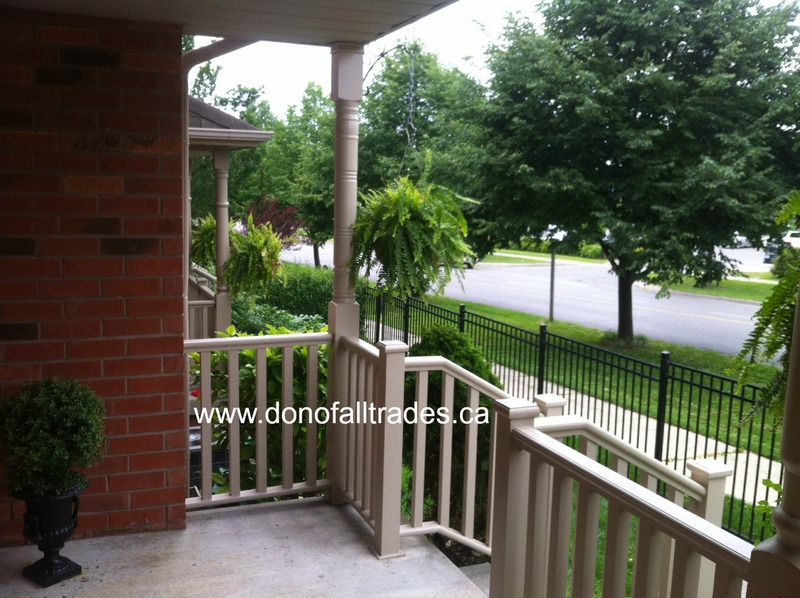 Front porch is more inviting, has more curb appeal and value to this home.